I recently sat down to watch the newest film written and direct by Woody Allen, Midnight in Paris, and was struck by its theme. Why are we nostalgic and what's the use of being nostalgic? The story follows a screenwriter, Gil, through his wanderings in the beautiful city of Paris. He's experienced a dangerous condition known as writer's block as he struggles to make himself something more than a mere screenwriter hoping to achieve the lofty title of author. As he wanders through Paris, he is picked up, at the strike of midnight, by revelers in 20's garb. He's let out into the world of Paris in the 20's and he meets all the famous ex-pats that made the City of Lights their home during that period of intense creativity. Illuminaries like Fitzgerald, Hemingway, and Picasso are all there to welcome him to this world of the past. Of course, through reflection and a trip to the Belle Époque, Gil makes a startling realization when the film's love interest tells Gil to stay with her in that time. "Adriana, if you stay here though, and this becomes your present then pretty soon you'll start imagining another time was really your... You know, was really the golden time. Yeah, that's what the present is. It's a little unsatisfying because life's a little unsatisfying." 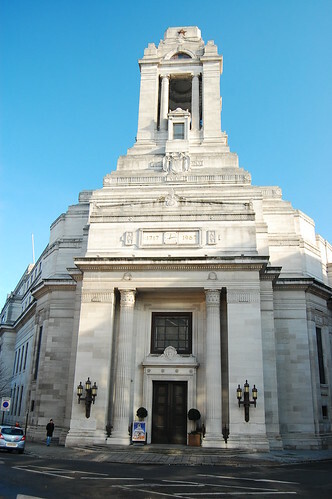 I started to look back at my own Masonic journey. I started in Boy Scouts, learning self improvement through personal growth goals via merit badges and the Eagle Scout award. Later, I became interested in Masonry without any real, good information during the bad old days of the Internet. Finally, I found my Abe Simpson, my paternal grandfather, right there, a longtime member of his lodge wondering why it took so long for me to put two and two together that he was a Mason and that I could ask him to join. As I've grown into this Masonic life, I've found the good and the bad of nostalgic thinking. I have found the most satisfying parts of this journey in my own family history. Finding out that my grandpa was a Mason was amazing but then I found out that both my grandpas were Masons and one was a Sir Knight and the other a Shriner, I was wistfully content. Masonry was in my blood, in my heart. As I looked through more of my family records, I was finding great, great-greats, and possibly great-great-greats who were also Masons. I imagined the Masonry of their era, a time of suits, pocketwatches, elegant dinners, and a sense of greatness. I wanted to be a part of that time and some days, I still do. It wasn't just Masonry, I was mournfully longing for the past. The present is tough. Things move fast, family and work lead to stress, and the modern age just feels generally busy. Yet, I knew that the past was never meant for me. My time is now, my understandings and existence depend upon this era. Hell, I wouldn't even be writing this article if I lived back then. But that elegiac feeling still exists, or maybe even persists, in me. We hear in Masonry phrases like, "wasn't that way in my year", "that's not how we do that" and other cliche statements made by brothers not seeking to change things. There are certain things in Masonry that must remain as they are. These are our landmarks, our guideposts to the past. Yet, I fear we sweep many non-Masonic innovations in with our landmarks. Our Order is built from stones hewed during the past. Temples have been built, physically and spiritually, to stand as testaments of our tenets and we are the fortunate recipients of that time and effort. Yet, at times, I feel the temples we live in now have become dilapidated. We allow the drapes to yellow, the stonework to weather, and the foundation to crack for fear of destroying that past, of insulting that memory if any of our efforts cause more harm. We feel the history and tread softly. Nostalgia serves to mask recent innovations in the cloak of tradition. Many lodges run on a progressive line even when our ancient brothers did not. Our lodges have long-winded discussions on business, the minutes, and the Treasurer's report because it has been done that way for many decades. Many lodges don't have meals together. We see changes to the Fraternity of the recent past that choke out the changes needed for the future. I would argue that we must take it upon ourselves to stop being excessively nostalgic, seeing its most destructive tendencies, and pushing to define the new century of Freemasonry. Just as the light bulb replaced the gaslight, we should find those things in our Craft that are inefficient and dangerous to renewal and replace them. Here's a list from the top of my head. We need to have quality programs focused on modernity. Focus on modern philosophic study, on new scientific advances, or on ways to better ourselves as men and Masons. We should eat together even if it's at a restaurant, off the menu. Our lodges should resemble something more than service clubs. I wonder, outside of a clear intent, if the Traditional Observance model focuses too much on the nostalgic when its greatest strength is its call to focused Masonry. I think most of the traditional observance model ideas are novel and perhaps the moniker of 'traditional' somehow creates a wrong impression of what the movement can do. Again, is nostalgia good, worthwhile or even correct? Should we seek out the past to prepare for the future? Should we assess what we have now? We have the tools to make Masonry relevant. Instead of spending time on selling a product only to leave the new Mason with a sense of blah, we need to renovate our physical and spiritual Temples, honoring our ancient brethren, and worry more about protecting the memories. It is our time to lay and hew stones, to build our own temples; it's our time to make Masonry.